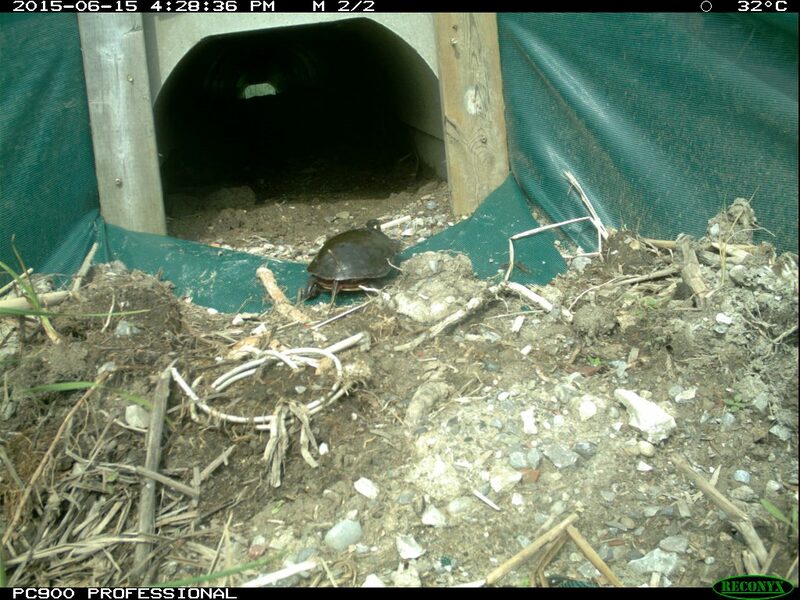 Safe Passage: A Midland Painted turtle enters one of the new culverts that were installed under the Causeway in the fall of 2014 to enable wildlife to pass safely under the busy road. Port Rowan, July 17, 2015 – Two more aquatic wildlife culverts could be installed on the Long Point Causeway over the next two years thanks to a grant of $580,000 from Environment Canada’s National Wetlands Conservation Fund. 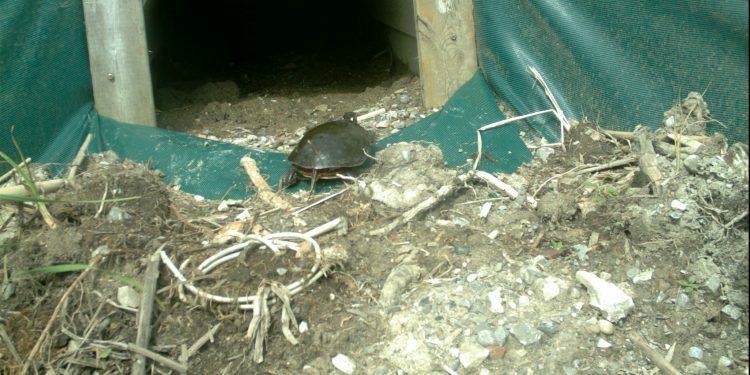 The culverts would restore historic aquatic connections between the Big Creek Marsh National Wildlife and Long Point Bay, and provide safe passage for wildlife under the road. The project was given the go-ahead by Norfolk County Council on July 14. One culvert, slated for construction in the late fall, would be located at the south end of the Causeway close to where the original mouth of Big Creek once emptied into the bay. The creek mouth was filled in during the 1950s when the 200-foot-long bridge that spanned it fell into disrepair. A marina has since been built at that location. “This culvert is intended to restore vital water circulation through the southern end of the marsh which is now essentially land-locked,” said Paula Jongerden, Chair of the Long Point Causeway Improvement Project (LPCIP) steering committee. “Its construction would open up vast new fish spawning areas in the marsh and help to reduce siltation loading on the Bay.” Jongerden noted that the southern area of the marsh was once a productive spawning area for muskellunge, a large fish species that had all but disappeared from Long Point Bay until recently. A second culvert is planned for installation at the extreme north end of the Causeway in 2016. The culvert would connect the Big Creek Marsh with the privately-owned Smith Marsh that empties into Long Point Bay. Since the Project began in 2008, road kill of reptiles on the Causeway has been reduced by more than 50 per cent. The construction of these two culverts is virtually “shovel-ready” thanks to previous funding from Environment Canada’s Habitat Stewardship Program for Species at Risk and Ontario’s Species at Risk Stewardship Fund and in-kind support from Norfolk County. This work included carrying out a full Environmental Assessment, conducting various studies and completing the design and engineering of the culverts. The LPCIP will be working with Norfolk County and Stephen Burnett and Associates, the consulting engineers on the project, on the preparation of a construction tender to be issued later this summer and securing additional construction-specific approvals from various government agencies. The Long Point World Biosphere Reserve Foundation (LPWBRF) will be covering all costs related to the construction of the two culverts. To date, the LPWBRF has raised about $2.2 million for its work to reduce the negative effects of the Causeway on the surrounding ecosystem. The Long Point Causeway Improvement Project is managed by Steering Committee comprised of representatives from 16 government agencies and local organizations and several individuals well-known in the community. The LPCIP receives financial and administrative support from the Long Point World Biosphere Reserve Foundation, which promotes research, monitoring, education and projects that support the goals of conservation and sustainable use in the Biosphere Reserve.